In astronomy, as in any science, there are things which we know and things we don’t know. There are also things which we see, and things which we can’t see. Dark matter though, is one of those subjects out there on the frontiers of human knowledge. All we can see are its effects. We don’t know what it is, and nor can we actually see it. And that’s a dangerous place to stand, scientifically speaking. The presence of dark matter was first inferred back in 1932, by Jan Oort. Noticing the speed at which the Milky Way is rotating, Oort’s calculations showed that if the visible matter is the only matter present in the galaxy, then the velocities are all wrong. Stars are revolving around the galactic centre much too fast. The entire Milky Way should be flinging itself apart at that speed. But it isn’t, and nor do any other galaxies. Oort concluded that the only way this would be possible would be if there was also invisible matter in the galaxy. A lot of invisible matter. The calculations showed that 83% of the mass of the galaxy was completely invisible! The following year, Fritz Zwicky drew much the same conclusion while looking at galaxy clusters. For the next 80 years, dark matter would be serious business. Huge research efforts have gone into studying, mapping, and trying to identify and explain dark matter. So far, those efforts have been largely fruitless. 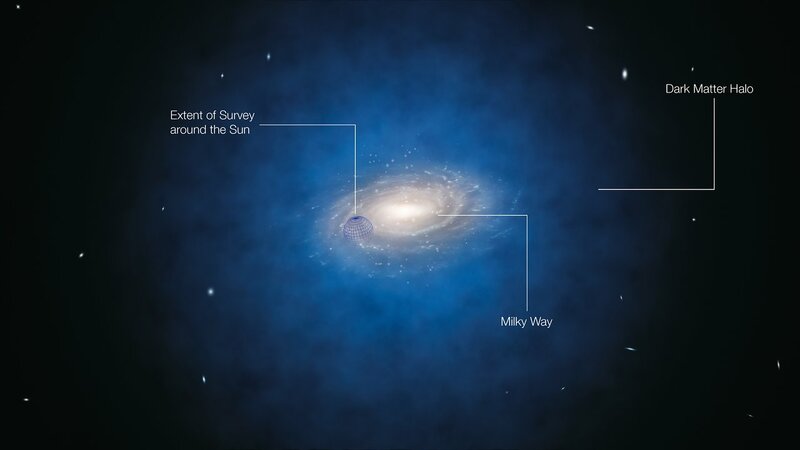 Studies have been done mapping out dark matter and looking at the effects of dark matter, like gravitational lensing. Many expect that dark matter is probably composed of some kind of unknown subatomic particle, and there are even experiments based on Earth attempting to detect dark matter. Because in theory, it should be everywhere. Errr… So this latest finding is a bit embarrassing. A group of Chilean astronomers made an extremely detailed effort to study the motions of around 400 stars in the part of the galaxy around the Sun… and they didn’t find anything! According to their study, all of the motions of stars in the local part of the Milky Way match perfectly with what they can see, and nothing more. As far as they can tell, there’s no dark matter here. Nothing to detect in the Earth-based experiments, and no way for any of the current theories to explain the lack of dark matter in the local stellar neighbourhood. Needless to say, this comes as quite a shock. Actually, on mentioning this particular news story to a couple of friends of mine, their initial reaction was much the same as my own — some pretty intense skepticism. The first thing pointed out is that the effect of dark matter isn’t expected to be particularly high within the galaxy. Perhaps the study was simply on too small a scale. This does make sense. If it’s uniformly distributed everywhere, then the overall effect would be expected to be negligible. But then, if it’s affected by gravity (which is, after all, the whole point) then logically there should be some local variations caused by the gravity wells of stars and other objects. To assume otherwise defies logic, surely. Or perhaps it’s an asymmetric effect, and light matter may be influenced by dark matter, but dark matter may not be influenced by light. But that would contradict what we know about gravity and how it works. For me at least, there are still a lot of questions here. If I were more knowledgeable on the subject of dark matter myself, I might be able to give a more authoritative opinion, but this is unfortunately outside my area of expertise. Mind you, dark matter isn’t the only solution. There are a number of alternative theories out there which attempt to circumvent the problem by modifying the known laws of gravity. They aren’t universally accepted. Or acknowledged. Or, in certain circles, even particularly popular. But all the same, it’s likely that a number of theorists out there are eagerly rubbing their hands with glee over a finding like this one. Or, maybe there’s more to it than people are seeing. I’ll hastily point out that I’m not at all knowledgeable about dark matter. Far from it, in fact. But I’ve sat through enough of these talks to know that it’s a standard assumption that dark matter is smoothly distributed in an overall spherical shape (or occasionally, as a kind of dark matter pancake which matches the disk of the galaxy). But really, is that a valid assumption? This study only looked at a small patch of the Milky Way. What if it isn’t smooth and evenly distributed? What if it’s clumpy like drops of ink in water? It wasn’t too long ago that people thought the interstellar medium was smooth and evenly distributed. We now know quite well that interstellar matter forms clumps and clouds. Perhaps dark matter might do the same. This entry was posted in Imported from Livejournal and tagged dark matter. Bookmark the permalink.